This nice little coffee place, Intelligentsia, (sort of) recently opened near my work. I am not always jumping on trendy places, but given that this place opens and 6 AM and offers non-dairy lattes, I jumped right in! While I don't drink coffee often, lattes are a nice and relatively healthy treat when consumed in moderation, and I rarely ever finish them when I get them (except for the ones from here!). Anyway, this place is so close that I can walk there during my lunch breaks, weather permitting. 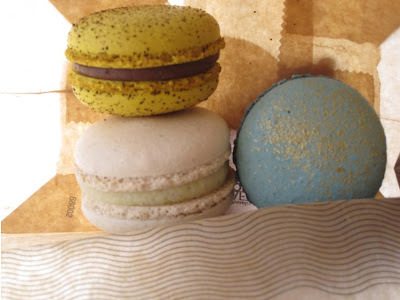 I sampled some French macaroons. My sisters are really into these. I think they are okay, but by now I've tried enough of them to be able to distinguish a good one from a bad one. Eh. They weren't that good. The yellow one sort of had a coffee flavor. The white one was more vanilla-y, and the blue one... I couldn't even tell what it was. Maybe some sort of chocolate? I was not impressed. They are really cute, though (yes, still inside the bag)! On a separate occasion, I came here with "The Ukrainian" and shared this cookie. I don't like chocolate-y cookies, so I found this to be just "okay." It wasn't overly sweet but did have a nice cocoa flavor. 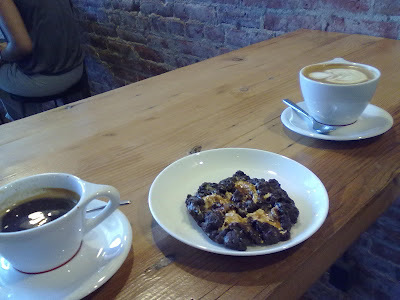 On the right of that cookie is the reason I do keep dropping by Intelligentsia -- soy decaf latte. Besides its beauty, it is THE best soy latte I've ever had. The roast on this coffee is not sour or bitter at all (even as decaf), and the soy is whipped ever so nicely to the point that the first time I had it, I thought it was just plain amazing. We have an Intelligentsia here in Chicago and the coffee is amazing. But I still love my Starbucks. i really LOVE the cake monkey muffins they have there.